The post successfully struck a nerve, with a barrage of nit-picky posts appearing on Facebook about how the restaurant is “overrated”, its food “unpleasant”, or its environment “unclean”. Tipping is unique to the food industry. As a doctor, never once did a patient hand me an extra Rs20 note as a thank you for a good knee exam. The reason is that we expect a doctor to receive adequate compensation for his work through the bill alone. It was when I put down my stethoscope and took a hiatus, serving chai to paying customers at my own café, did I develop a greater appreciation for this art. Tipping persists in the food industry because we don’t expect the labour to be paid what they are due. Serving food and drinks at a restaurant or a café is considered menial or even dishonourable work. Restaurant owners are thus usually happy passing a chunk of their responsibility to the customer when it comes to rewarding the servers. This may be unfair because all labour is equally important, but this is the world we live in and servers expect to be tipped for their service. While we endlessly debate on the appropriate amount to tip a waiter at a restaurant, we all lean on the side of under-compensating the server’s hard work. A picture uploaded recently by Easy by Fatsos is making the rounds on social media. 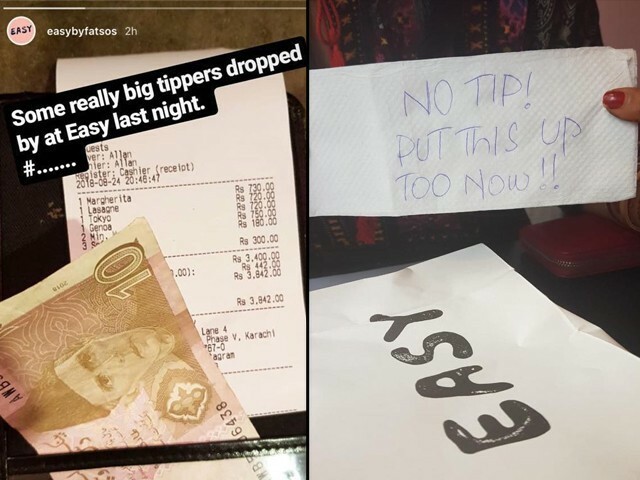 This restaurant in Karachi photographed a Rs10 tip received on a Rs3,840 bill, with a sarcastic caption aimed at poor tipping habits. The post has successfully struck a nerve. 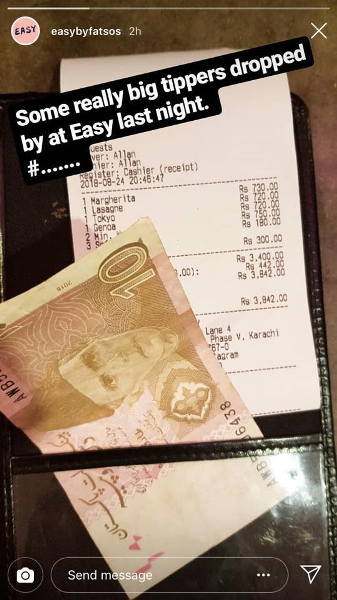 Nobody wants their kanjoosi (lack of generosity) displayed on the internet, and the most obvious counterattack was that the restaurant’s service isn’t worth more than a Rs10 tip. A barrage of nit-picky posts appeared on Facebook, about how the restaurant is “overrated”, its food “unpleasant”, or its environment “unclean”. We live in an age where every disgruntled customer sells himself or herself as a qualified food critic online. The difference is that a food critic has greater empathy and deeper appreciation for the hard work that goes into running an eatery. A professional food critic’s word isn’t revenge against an overpriced meal, but a detailed examination that is more than just a narration of one’s personal experience. If someone leaves you Rs10 as a tip, which is less than 0.3% of the bill, you’d probably feel slighted. In some way, it is possibly worse than not tipping at all, because one can at least blame a non-tip on one’s forgetfulness. But instead of the customer, social media aimed its guns at the restaurant. A defiant review appeared on Facebook, published on SWOT’s Karachi page, proudly announcing a customer’s refusal to tip the servers at Easy. Let’s be clear. Your server is usually not responsible for anything more than table service. It’s not your waiter’s job to make your food taste better. It’s not your waiter’s job to fix the establishment’s air conditioner. Your waiter’s job is to greet you, take your order, serve your food, and listen patiently to you complain about water dripping from the air conditioner, or as you call it, “rain”. That’s labour, and it deserves respectful compensation. If you have issues with the establishment’s performance as a whole – from ambience to the taste of the food – you don’t take that out on the poor server while quietly paying the establishment the bill in full. As a doctor, one becomes accustomed to a certain level of respect in society. About a month ago, I chose a simpler life; opening up a worker-owned café in which I serve tables myself. The contrast is sometimes jarring, and I’m often forced to signal that I am the owner, as that’s the only way I can get a modicum of respect. Serving food and beverages to smug, finicky customers all day long is gruelling work, and a tip is a great way of showing you acknowledge this labour. For a sizeable party of customers to leave the serving staff Rs10 as tip is representative of one’s elitist disrespect for the worker. It’s worth reminding that you’re tipping the worker, not the owner who refuses to fix their AC. As an owner, I’ve never asked for a tip, nor have I ever complained about not receiving it. But then again, I’m in a privileged position to be the owner and not a paid server. Ideally, we shouldn’t have to tip. Ideally, we shouldn’t be a third world capitalist country with dirt-cheap labour, instead of one where all work is equally respected and fairly compensated. Until then, be generous in tipping the server for his or her effort. If you can afford a Rs4,000 dinner, you can surely find a crunched-up Rs100 note or two in your wallet. 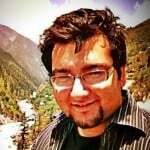 Why don’t you start a trend of linking sales and servings with the tips ?. (it should be optional at first), somewhere in the range of 2% of the bill so 3840 would fetch around 80 Rs Tip, which is reasonable.. Agreed, the server gets virtually no paycheck from the restaurant where he or she works, and depends mostly on tips to make ends meet to feed their own family! I never leave less than 15% plus, and usually more if the check is small! True, the server is not the cook, the cleaning staff, the maintenance guy etc. demeanor. Not all servers are angelic. There is such a thing as bad service. the service stank or was exemplary. Like it or not, people want their food served in a nice pleasant way in a restaurant. And will go to a particular establishment, regularly, because of a favorite server there. How can one not agree with what you’ve said. I don’t understand the concept of the “tip” to be honest. The waiter is getting paid to greet and serve the customers (it’s his/her job). If the waiter is doing exceptionally well then it should be the employer who needs to compensate him/her not the person being served who is already paying for the food (that includes staff salary etc). I don’t agree with this blog at all. Why do I have to pay a tip to a server. It should be my choice. Do you pay tips to plumbers, electrician or any other guys for maintenance in your house? I don’t think this is the case. They can be needful as well. Servers at restaurants have defined salaries by the owners, and they are just their job. Appreciate your point of view but a restaurant waiter’s station and the incident you described at the cinema are different. In Pakistan like in other places, in general, the restaurant server is usually employed on a a very basic wage with the understanding that he would make up the difference in tips, as such the need to be a little generous. It’s called ” No Hippocratic Oath “. Tipping is a cultural invention and not necessarily an “appreciation” for someone’s hard work. If you tip in Japan, that’s considered an insult. Because in Japan, service is supposed to be exceptional all the time. In France, you are expected to only tip if you considered the service to be truly exceptional. Otherwise it’s not a norm to tip every time. Whichever way you look at it, tipping is an extra expense and not everyone is too enthralled to submit to it. If you think a waiter deserves extra credit for the service, why not tip the staff that cooks? In some manners, cooking is even more grueling than serving a customer. Multiple orders coming in simultaneously, the need to maintain hygiene, multi-tasking, etc etc are all factors that make the job of a cook even harder, yet we don’t tip them and no one bats an eye on it. In that regard, the janitor that wipes the floors of the building establishment that everyone works at also deserves a tip. Even doctors deserve it! When you’re just out of medical school and doing an internship and grueling long hours of service, and only get paid a meager salary, that’s much more deserving of a tip. Last time I visited Pakistan, many restaurants charged extra service charges for table service.